James Finch (or Fynche) (d.c.1508), Citizen and Shearman, was the father of Margaret, Countess of Kent, and a benefactor of The Company of Shearmen. Finch lived in the parish of St Michael, Cornhill, London. He had three daughters Elizabeth, married to Philip de Caruge, Citizen and Draper; Joan/Jane, married to Nicholas Waring, Citizen and Salter; and Margaret married to Richard, Earl of Kent. Upon his death, Finch was buried in the cloister of the Whittingdon College, in the parish of St. Michael, Cornhill, in accordance with his wishes. Finch built up significant wealth through mercantile activity, including a property portfolio in the City, during his career. He appears to have been involved in numerous transactions recorded in the Close Rolls, and court records. The first reference to a James Finch occurs in 1470, when he is recorded in the Close Rolls giving a gift of his goods and chattels in the City of London and all his debts to Walter Buk, Clerk of the Arches, Humphrey Starkey, Recorder of the City of London, William Heryot, Alderman, Nicholas Stathum, gentleman, and Richard Rysing, Shearman. By the sixteenth century, Finch appears to have involved himself in numerous legal wranglings. Some of these included the payment of recognisances and disputes at the Court of Common Pleas. He is noted as providing recognisances to the King, with other London men, in February and March 1504 to the value of £2000 and £500, respectively, relating to imports at Southampton. By 1500, he had entangled himself in a dispute at the Court of Common Pleas, where he was named as the defendant in a case relating to the non-payment of a bond of £33 6s. 8d. between him and William Waldyngfeld. Waldyngfeld’s executors claimed ten pounds in damages against Finch, whose defence was that the original executor of the Waldyngfeld’s estate, Robert Gretham, had issued him with a release from the bond. By his will of 15 February 1508, Finch made The Shearmen’s Company a significant bequest of properties in Haywharf Lane (in the parish of All Hallows the Great), and an interest in Jesus Commons (in the parish of St. John the Baptist). In Haywharf Lane, Finch’s property comprised thirty-six messuages and a wharf. These properties passed to The Clothworkers’ Company when The Fullers and Shearmen amalgamated in 1528. Under the terms of his bequest, Finch instructed the Company to find and sustain a Doctor or Bachelor of Divinity at Whittington College of London, to read divinity within the college three days a week. Finch also bequeathed his interest in the property at Jesus Commons to the Company. Finch held the property on a ninety nine year lease from the Abbess of the Minories without Aldgate of London, paying £3 6s. 8d. rent a year. He had undertaken significant repairs at the property, and intended that it should be a used as a commons for priests. Finch gave his term of interest to the Company, stating that any profits garnered from the lands, after repairs and rents had been discharged, should be retained for the Company's common box for common charges. TNA PROB 11/16, Will of James Finch, 15 February 1508. 'Close Rolls, Edward IV: 1468-1471', Calendar of Close Rolls, Edward IV: volume 2: 1468-1476 (1953), pp. 196-208. URL: http://0-www.british-history.ac.uk.catalogue.ulrls.lon.ac.uk/report.aspx... fynche, sherman Date accessed:19 November 2010. 'Close Rolls, Henry VII: 1503-1504', Calendar of Close Rolls, Henry VII: volume 2: 1500-1509 (1963), pp. 105-116. URL: http://www.british-history.ac.uk/report.aspx?compid=111304&strquery=james fynche Date accessed:19 November 2010 and 'Close Rolls, Henry VII: 1503-1504', Calendar of Close Rolls, Henry VII: volume 2: 1500-1509 (1963), pp. 105-116. URL: http://www.british-history.ac.uk/report.aspx?compid=111304&amp;strquery=... fynche Date accessed: 19 November 2010. 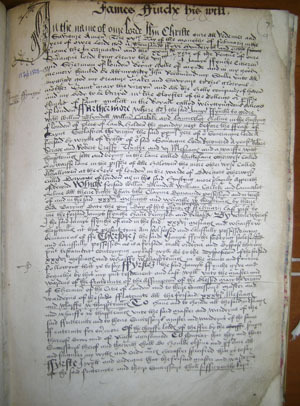 'CP40/951: Hilary term 1500', Court of common pleas: The National Archives, CP40: 1399-1500 (2010). URL: http://www.british-history.ac.uk/report.aspx?compid=118166&strquery=james fynche Date accessed: 19 November 2010. 'Report on the Charities of the Clothworkers' Company: Part I', City of London Livery Companies Commission. Report; Volume 4 (1884), pp. 572-599. URL: http://www.british-history.ac.uk/report.aspx?compid=69737 Date accessed: 28 October 2010.